With the new season of "Doctor Who" starting soon, here is why the show means so much to me. 2010 to 2012 were the darkest years of my life. While I had some of the best times of my life and made many incredible, lifelong friends those years, I struggled with depression tremendously. I hit rock bottom and then dragged along for what felt like an eternity. I was barely passing classes, I lost a lot of weight from not eating, and I was not happy with who I was. I was lost. I started going to church and made some amazing friends who were accepting in every form of the word. Being in a wheelchair, there are often times where I am left out of things because I can't get somewhere or do something. This group was more inclusive than anyone I'd ever met. They would go out of their way to make sure I could be involved, including the times they lifted me in my 300+ pound wheelchair up steps into different houses. That is when I started to accept myself. The depression began to lift, but in 2012 my best friend passed away and I felt it coming back in full force. In March of 2013, I randomly started watching "Doctor Who" on Netflix. I had no idea what this show was, but it kept popping up in my suggestions, so, I started it. I started the first episode (of the newer series) and, honestly, thought it was really weird. I didn't believe that it was something I would like at all, but for some reason, I kept watching. After three or four episodes, I was hooked. Now, for those of you who don't know, this show has been on for over 50 years. It ran from 1963 to 1989, there was a movie in 1996, and then the show was rebooted in 2005. I started with the newer series because that's what was available at the time. Plus, I had no idea it had been on longer. I finished season one and grew attached right before the Doctor regenerated. Naturally, I was devastated and did not want him to change to a new person. However, by the end of David Tennant’s first episode, I loved him. Tennant's three seasons are what actually made me love the show. It was exciting, it was funny, and it broke my heart over and over. Each time a doctor or companion leaves, I am upset and don’t want anyone new. Then I end up loving them and the cycle continues. Those of you who watch the show know exactly what I’m talking about. It’s an endless, vicious cycle that rips your heart out repetitively, but you can’t imagine life any other way. 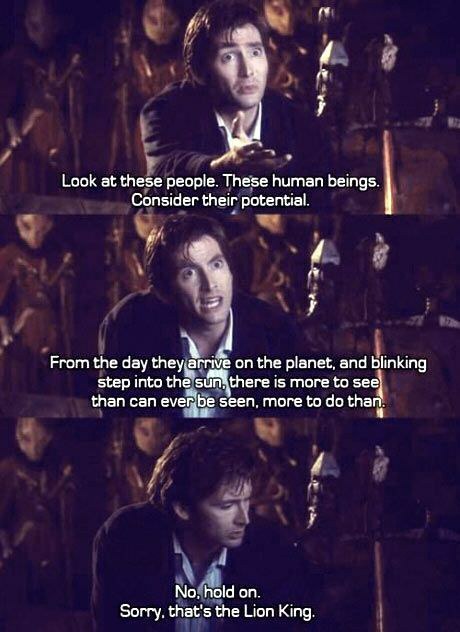 Ten, played by David Tennant, may be the Doctor who started this obsession, but I love them all. Eleven, played by Matt Smith, is probably my favorite, though it is really hard to pick. His three seasons are the ones I go back and re-watch frequently, and my favorite episodes and plot twists take place with him as the Doctor. While "Doctor Who" is entertaining and amusing, there are many serious moments as well. There are so many inspirational quotes throughout the series. (Look for an article next week with a list of my favorite quotes!) The new season is starting Saturday, April 15, and I could not be more excited! When I say "Doctor Who" is my favorite show, that is an understatement. This show changed my life and ultimately saved it. 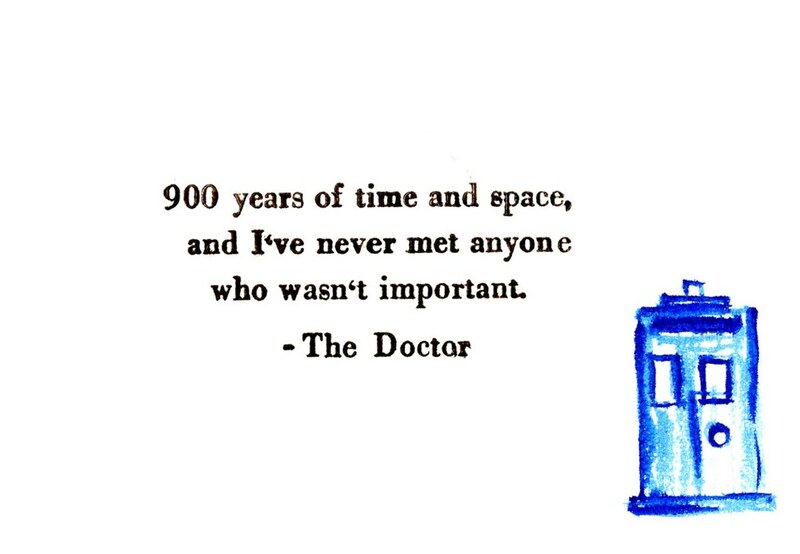 In a time where I was so full of self-doubt, "Doctor Who" showed me that everyone is important. It showed me that anyone can make a difference. This show has taught me that no dream is too big; it taught me to never give up and that, sometimes, even the impossible can happen. It showed me that it’s okay to find humor and happiness in life, even when your past has been filled with darkness. Being part of this “fandom” has shown me that it’s OK to be myself and that I am not alone. I have made amazing friends because of this show. Most importantly, though, I have accepted myself and know that I am important.